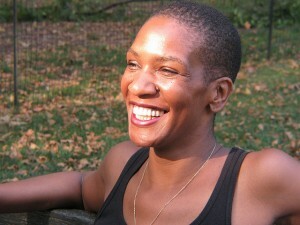 Pamela Sneed is a six-foot-three-inch-tall black woman with a shaved head, a big smile, and a wily sense of humor. Born and raised outside Boston, she began making a name for herself in New York in the early nineties as a writer at poetry slams and other performance-art venues while teaching at Hetrick-Martin, an organization for gay, lesbian, and transgendered youth. There and elsewhere, Sneed gave voice to the fraction of the city’s population suffering from AIDS, poverty, and bias-related crimes. In her new performance piece, “Kong,” at Long Island University’s Kumble Theatre, in Brooklyn, on Tuesdays Dec. 5-19, Sneed the activist tackles—from a distinctly and delightfully partisan point of view—our contemporary American cinema as it relates or, more specifically, doesn’t relate to race. And she’s taking on Katrina and our health-care system, while she’s at it. Gorgeous in her lack of restraint, Sneed has a voice—she earns a little money on the side doing voice-overs—that sounds like a cello, but a cello that’s interested only in dissonance, not the sound of mourning.